SpadsInc is involved in water treatment process, such as filtration, water sediment separation, aeration, disinfection and reverse osmosis. The Company's products include circulating water treatment equipment, water purification equipment, and wastewater treatment equipment. Spads Inc. was incorporated in May '93. It is family owned and managed. The name is an acronym of Stewart, Pauline, Adele and Danielle Stevenson.It all started when they decided to enhance their own home supply, which had a very high iron content and was not treated by the local water supply plant. They started with swimming pool filters that could not withstand the oscillating pressures of automatic water systems and eventually sourced the Matrix manual backwash valve and Structural mineral tanks along with minerals from overseas distributors. The system eventually proved worthwhile but too expensive for the average Guyanese household. This consisted of two 1 cubic foot mineral tanks connected in series, the first filter had a sediment removal media and the second activated carbon. Backwashing was manually done because of unreliable electrical supply. Bleach was added to the storage tank to disinfect the water. In 1994, Spads Inc. joined the Water Quality Association. The next step was to acquire better suppliers in terms of price and availability. In 1995 the company was opened to market the water filtration/treatment system they had developed. Mineral and retention tanks used are manufactured by Structural North America, media by Clack Corporation, commercial valves by Fleck Controls Inc. and residential valves by Matrix IV Inc. Because the market was so small (Population 700,000), other product lines had to be sold to compliment the existing one, water pump, pressure tank, chemical feed pump, distiller, Ultra-Violet and Reverse Osmosis manufacturers were contacted and asked for their Guyana distributorships. In addition to above their product line also includes water heaters, swimming pool chemicals and equipment, Ramset/Redhead Concrete Fasteners and tools, turf, lawn and drip irrigation, hose, brass and PVC fittings and valves. 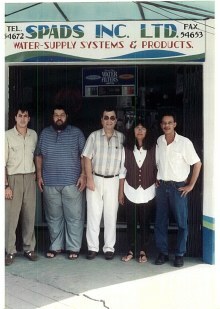 Their four hundred commercial/industrial customers include the two national water supply entities, the Georgetown Sewerage & Water Commissioners and the Guyana Water Authority, fish and shrimp exporters, hotels, bottled water and beverage manufacturers, restaurants and bars, the mining industry and most recently, garden centers and nurseries.